Ice Plants are sun loving succulents with 3 seasons of color interest. The Jewel of the Desert Ice Plants are drought tolerant, heat & humidity tolerant and non-invasive. Opal delosperma sports beautiful flowers with yellow centers surrounded by fuchsia petals. As with other ice plants, this colorful garden plant is a spreading thick evergreen mat. Use in dry areas for erosion control. Excellent choice for container gardening where watering is limited and rock gardens. Great where Firescaping or Fire Wise plants are better used. Opal ice plant attracts butterflies. Plant with companion plants such as sedum ground covers, creeping phlox or blue fescue. 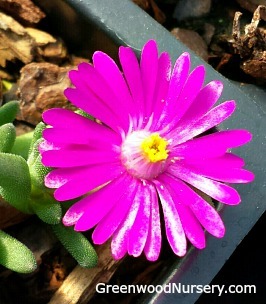 As with other delosperma, the Opal grows up to 6 inches tall and spreads up to 20 inches wide. Opal Delosperma ships in a 3.5 inch pot. Orders shipping to AZ and CA will be bare rooted before being boxed.